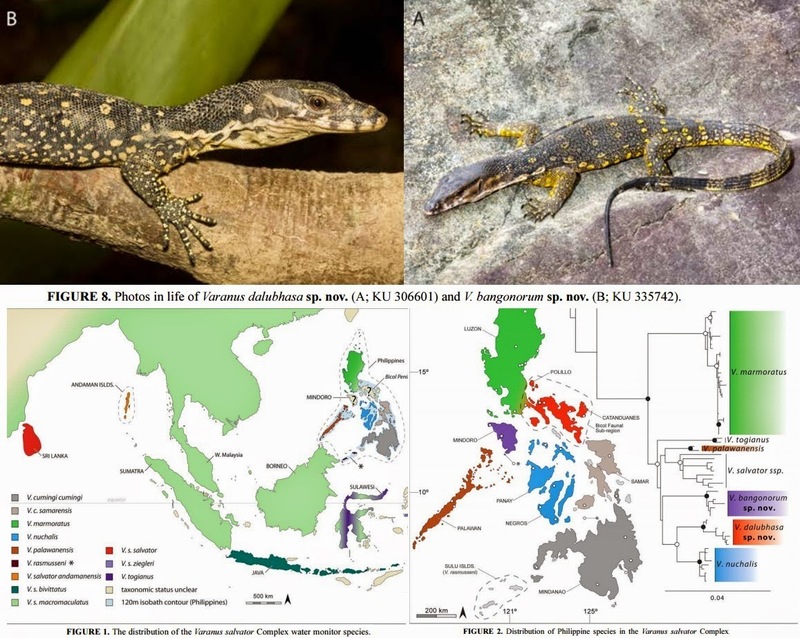 We describe two new species of morphologically cryptic monitor lizards (genus Varanus) from the Philippine Archipelago: Varanus dalubhasa sp. nov. and V. bangonorum sp. nov. These two distinct evolutionary lineages are members of the V. salvator species complex, and historically have been considered conspecific with the widespread, northern Philippine V. marmoratus. However, the new species each share closer phylogenetic affinities with V. nuchalis (and potentially V. palawanensis), than either does to one another or to V. marmoratus. Divergent from other recognized species within the V. salvator Complex of water monitors by as much as 3.5% pairwise genetic distance, these lineages are also distinguished by unique gular coloration, metrics of body size and scalation, their non-monophyly with “true” V. marmoratus, and insular allopatric distributions, suggesting biogeographically distinct and unique evolutionary histories. We compare the new species with the most geographically proximate and phenotypically relevant lineages. Although we show that these new taxa are nearly indistinguishable morphologically from V. marmoratus, both species can be readily distinguished from their closest relatives (each’s respective sister taxon, V. palawanensis and V. nuchalis) by traditional morphological characters. Our findings underscore the high herpetological diversity and biogeographical complexity of vertebrates in the Philippines, and further emphasize the need for detailed study of species-level diversity, mechanisms of reproductive isolation, gene flow, and biologically relevant boundaries between taxa within the V. salvator Complex. Welton, Luke J., Scott L. Travers, Cameron D. Siler & Rafe M. Brown. 2014. 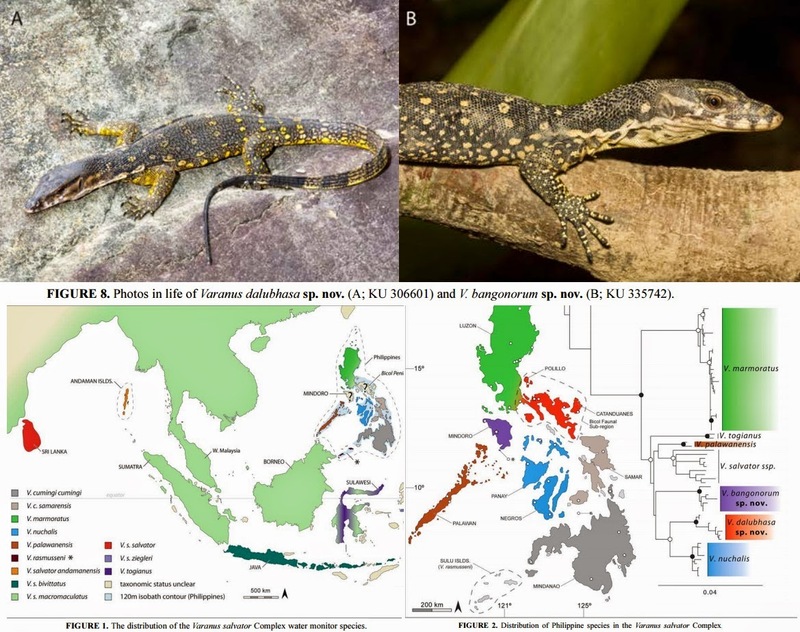 Integrative Taxonomy and Phylogeny-based Species Delimitation of Philippine Water Monitor Lizards (Varanus salvator Complex) with Descriptions of Two New Cryptic Species.